So, you’re a group of people strolling around town and it’s now that time of day when you need to feed your howling bellies. The only problem is that one wants a bowl of Vietnamese noodles, the other yearns for a tempura maki roll and you, you just long for a good old burger. Rest assured, I have just the place for you: Welcome to K25. 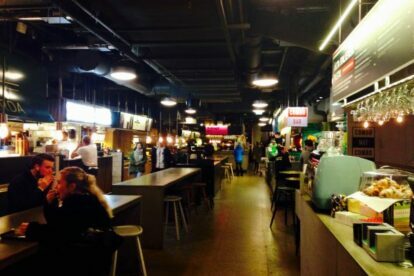 K25 is a food court situated on Kungsgatan 25 (hence the name), just under one of the great bridges in the Stockholm city centre. Let me just tell you – K25 does not in the slightest way resemble any of those sad food courts you might have encountered in an American shopping centre. K25 is more like a cool and vibrant marketplace, filled with 11 different restaurants. Your friend can buy her fresh bowl of Pho noodle soup with beef broth, the other guy can sink his teeth into a tasty tempura-battered Hotto Maguro and you, my friend, can enjoy a tasty cheddar and bacon burger from Vigårda. The seating is free, so buy your fav food and then have a sit down by one of the bar tables or the theater-styled benches in the back of the locale. K25 is also a great place to stop for a beer, soda or a glass of wine. At K25 you can experience good variety of international cuisine, from early morning to well into your afterwork. And there you go – food problem solved!